Subsidized to a talk-event: "Simulation and Form - The Photography and Experiments of Shozo Kitadai" exhibited at Taro Okamoto Museum of Art, Kawasaki. The exhibition “Simulation and Form - The Photography and Experiments of Shozo Kitadai” at the Taro Okamoto Museum of Art in Kawasaki took place from October 19, 2013 to January 13, 2014. Shozo Kitadai (1921 - 2001), who used to be a key-member of the artist collective Experimental Workshop (Jikken Kobo), was as an individual artist active in a broad field, his mobiles, paintings, stage designs, films and so on, achieved high acclaim. In 1953 the collaborative work with photographer Kiyoji Otsuji for APN (Asahi Picture News) became an occasion for him to expand his practice to the field of photography. Initially his use of photography was experimentally tentative, yet after his proclamation “From Painter to Photographer” (Gaka kara shashinka e) in 1956 his artistic production shifted from the so far produced painting scrolls towards photography. Afterwards he published a set of experimental photographs for commercial use in Gurafikku Shudan. However, the Osaka World Exposition 1970 marked the climax of a period of high economic growth, and the expansion of technology cast long shadows bringing about excessive energy consumption and environmental pollution. Having his doubts about such a technocratic society, he stopped to work as a commercial photographer. Kitadai eventually adopted a handicraft art practice, resulting for instance in his detailed model aircrafts, the so-called Hand-Launch-Glider, and artworks such as a hand-made camera, or kites. In this exhibition the complexity of Shozo Kitadai’s oeuvre became obvious through the presented works, ranging from photography for Jikken Kobo and Gurafikku Shudan over photos exposing the industrial world or venues of high-technology, to his model aircrafts. Starting with “APN” from the “Experimental Workshop” (Jikken Kobo) period, “Wood” (Ki), “Aesthetics of an Automobile” (Jidosha ni tsuite no bigaku), and from the Grafikku Shudan time “Backseat Photography” (Bakkushitito no tame no shashin), the “Handle” (Totte), of “Space Modulator”, and after all the “Vision of the Unknown” (Michi no bijyon) series, reaching to the “Model Aircraft” (Mokei hikoki), being exposed to all these different aspects of Kitadai’s creativeness, the various media he used, it seems only consistent to tell not only the story of Kitadai’s “simulations” (experiments), but also the characteristics of his personality. 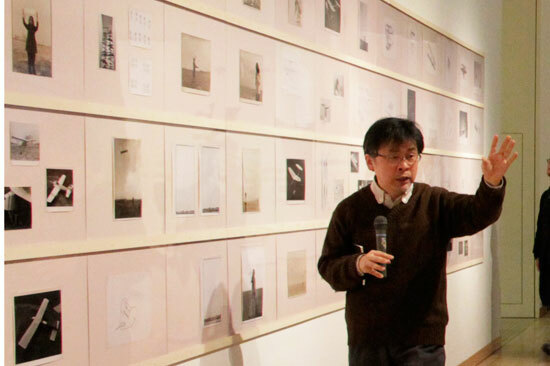 JCRI subsidized two lectures by Kin’ichi Obinata, one of the most outspoken photography historians. On occasion of the first event, 55 people gathered for a gallery roundabout along Shozo Kitadai’s photographs at the exhibition venue, allowing an overview over the different phases of Kitadai’s activity. 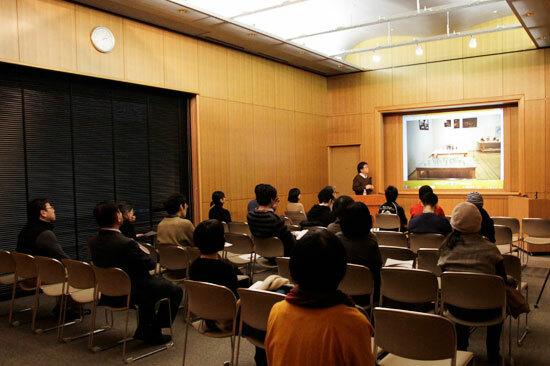 On occasion of the second event, attended by 25 people, so far scarcely discussed research reports concerning the effects of Grafikku Shudan were presented to the visitors, for whom it became an opportunity to deepen their knowledge of artworks and artist.